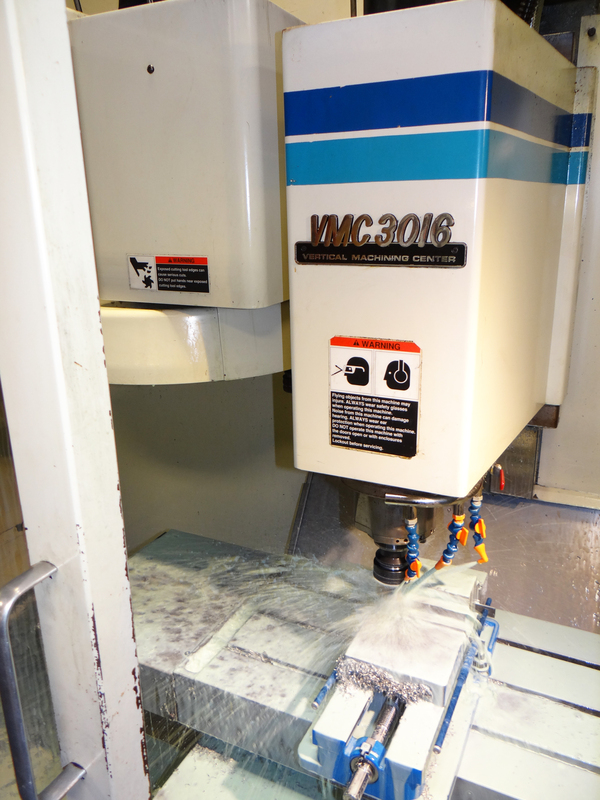 Fadal Parts Repair Service 3016 VMC CNC Vertical Machining Center Retrofit upgrade. Fadal 3016 VMC CNC Vertical Machining Center Retrofit upgrade. Stop buying replacement parts and paying for expensive repairs, Upgrade the CNC control and put the machine back to work for you. Located in Houston, TX Jerald Mittasch President of Mitco Manufacturing and Machining LLC specializes in making valves for the oil field. 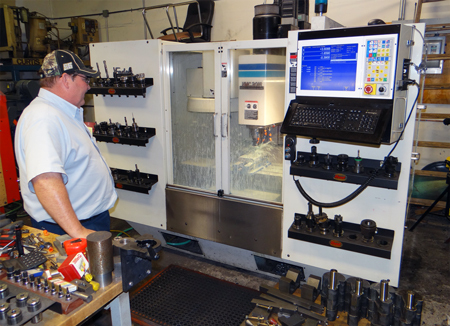 Jerald started into CNC machining with two SuperMax CNC knee mills retrofitted with Centroid CNC controls, Jerald says “those machines are now almost 10 years old” and “they are solid machines” and that they gave him, “the opportunity to do things that no body else can do”. 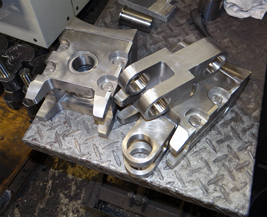 In addition to oil realed work, Jerald makes replacement 12” electric arc furnace electrode clamps that handle 20,000 amps of current at 240 volts. 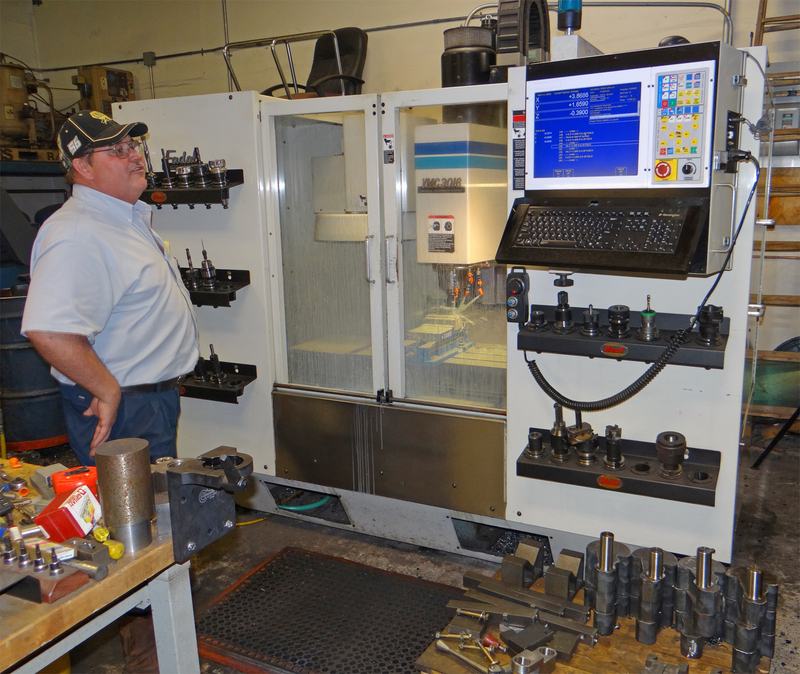 Jerald has to reverse engineer the parts using his Fadal 3016 which has been retrofitted with a Centroid M400 CNC control. He says “there are no prints provided for the clamps”, his customer just sends him the broken original parts to recreate and he uses Centroid M400 to recreate the parts, often improving on them at the same time. Jerald says he uses Centroid's conversational programming "Intercon" for 99% of his work. The Fadal 3016 was originally equipped with DC servo motors, while the DC motors could have been retained, at the time of retrofit the decision was made to replace them with new AC Brushless servos. The Centroid M400 can communicate with the new AC Servo drives via fiber optic cable which offers more speed, power, precision and reliability. 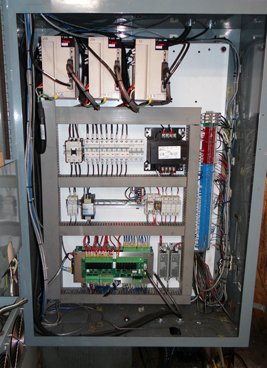 Here you see the reworked original Fadal electrical cabinet with the new CNC components installed. At the top are the X,Y,Z AC brushless servo drives. 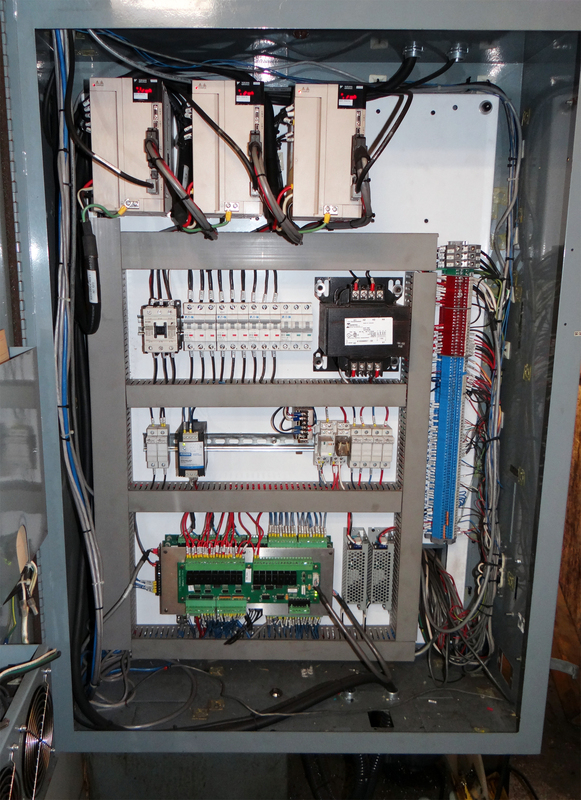 In the middle area are the circuit breakers and power distribution, along the right side is the I/O terminal blocks for limit switches, ATC sensors, Flood, Mist, and Lube control connections and at the bottom left of the cabinet is the Centroid MPU11 (motion control, encoder, mpg connections) and the GPIO4D (PLC, Spindle Control and IO) CNC control cards (stacked on top of each other to save space for this install). Terry Ruppe of Arrow controls who performed the retrofit installation on the Fadal says “that’s all there is to it”. Centroid has simplified the CNC control by eliminating cables and connections with made-for-CNC printed circuit boards that handle all the functions of a typical CNC machine tool. 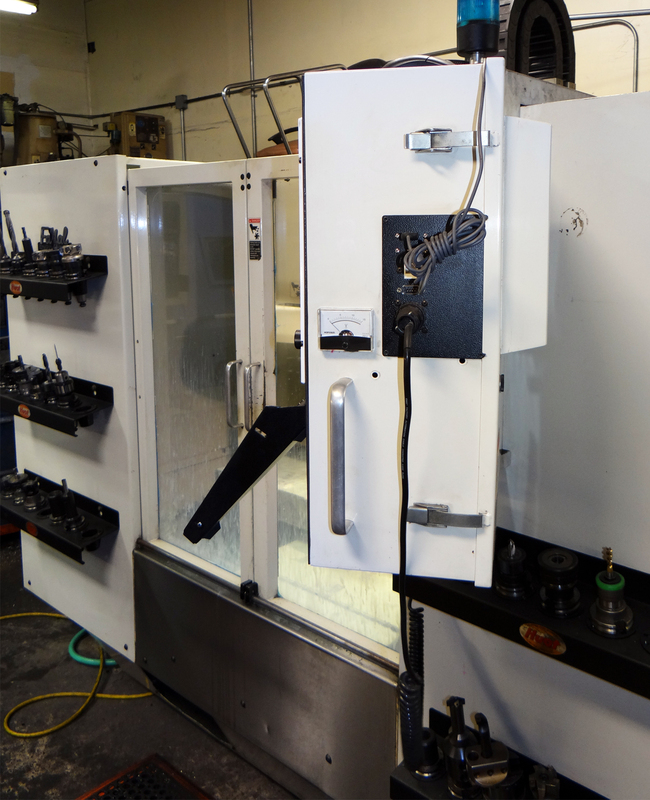 The Centroid M400 can be ordered in "panel mount" configuration which allows the installer to retain the original operators console sheet metal cabinet. Here you see how nicely the Centroid M400 fit into the stock Fadal CNC control location making for a very nice finished look. MPG and USB ports are located on the black panel seen on the right side of the console in the photo. Jerald's first step into a tool changer machine was this Fadal 3016, on some jobs he uses every tool bin in the ATC, Jerald showed us one part that uses 18 tools, and he mentioned that he takes advantage of the Centroid Tool Touch Off Probe to set up tools automatically. He says, “its a piece of cake, its so easy to do”.